This small crucifix dial is one of the two known instruments signed by Melchior Reichle, the other being a compendium (Epact 37591). The outer part of the cross shaped lid is engraved with a Crucifixion and the monogram 'INRI' on the top. The inside of the lid has a small compass with magnetic deviation indicated and the names of the cardinal points abbreviated 'M', 'OR', 'OC', 'S'. The bottom of the vertical arm of the cross has an unequal scale of latitudes, engraved 'ELEVAT<IO> POLI', from 42 to 54 by two. There are traces of other engraving underneath. The arms of the cross are decorated with foliage. The inside of the main box is empty. The outer sides of the cross are engraved, respectively, with the hour lines from 6 to 10, a linear decoration, foliate decoration, hour lines from 12 to 3, hour lines from 3 to 6, the signature 'MELCHIOR REICH [star] [star]', hour lines from 3 to 6, hour lines from 12 to 3, foliage decoration, linear decoration and hour lines from 6 to 10. At the foot of the cross is a skull. Pierced next to the foot of the cross on the sides of the main box, on the other side of the suspension ring, are two opposite holes. The support for setting the latitude is missing. 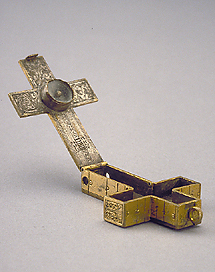 The outside of the cross shaped main box has two sliding rulers, engraved 1 to 12 and 13 to 24 respectively. The rulers are at the sides of two columns, numbered 8 to 12 to 8 in opposite directions. They are used to convert Italian hours into common hours and vice versa. On the arms of the cross is the inscription 'HIC FINI ESTV GANZ LAVTER VND KLAR [star] AVS DEN TEITSCHEN STVNDE: D: WEL: ZWAR [star]'. The instrument was presented by A.W. Franks in 1874, and is described in F. A. B. Ward, A Catalogue of European Scientific Instruments in the Department of Medieval and Later Antiquities of the British Museum (London, 1981), p. 34, no.73.